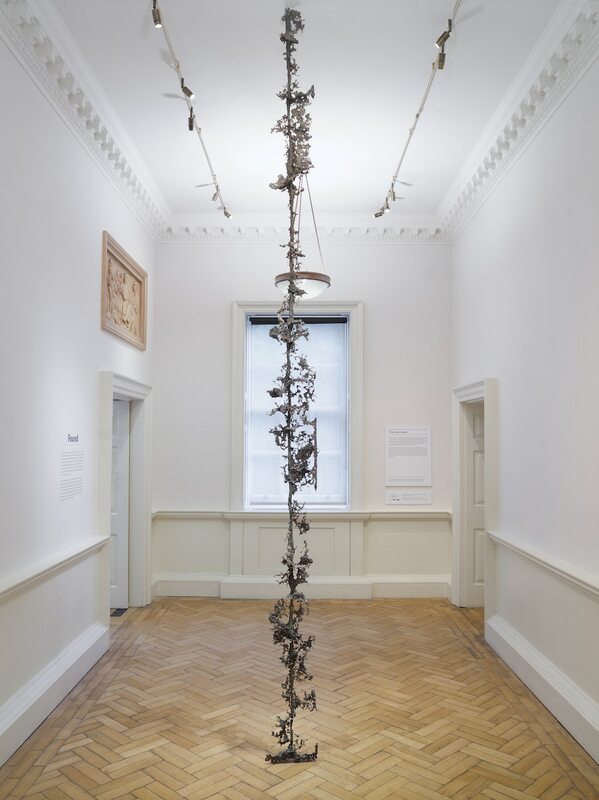 The Foundling Museum presents a new series of site-responsive installations by British artist Jodie Carey, commissioned by the Museum for display in the exhibition gallery and among the historic Collection.Carey’s response to the history of the Foundling Hospital has been to create a series of striking works that explore themes of love, loss and trace. 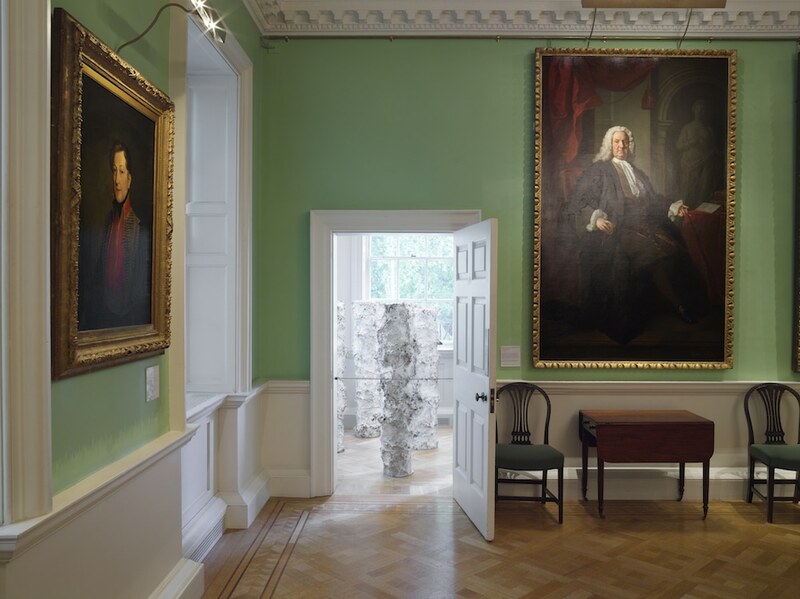 Imbued with a sense of remembrance, these sculptures encourage visitors to reflect on the thousands of children who passed through the Foundling Hospital from the 1740s – 1950s, and the fragility of human life and relationships. 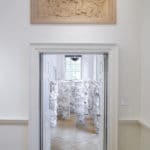 Drawing inspiration from the eighteenth-century fabric tokens left by mothers with their babies at the Foundling Hospital as a means of identification, Sea is a large-scale installation for the Museum’s exhibition gallery. 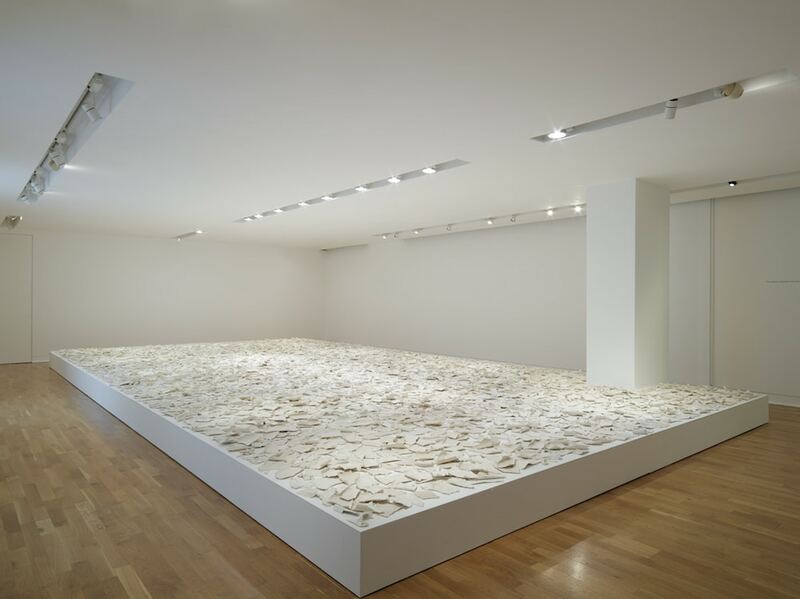 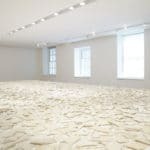 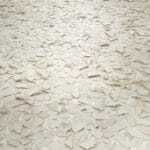 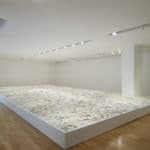 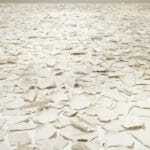 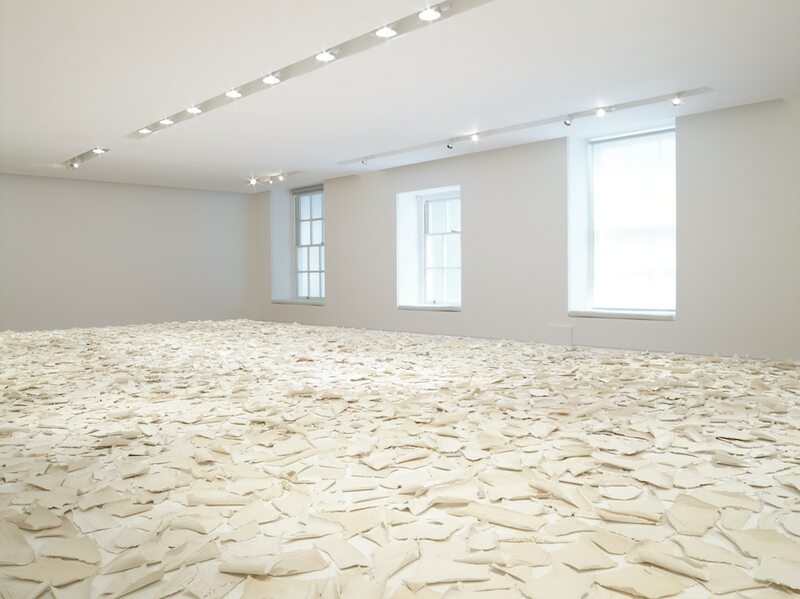 Sea is formed of hundreds of swatches of fabric that have been dipped in liquid clay and fired to create delicate, white ceramic fragments that cover the gallery floor. 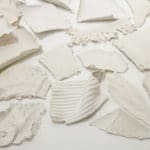 During the firing process, the fabric burns away leaving only a trace of its weave and pattern, echoing the fragility of the textile tokens which are one of the few remaining and tangible connections between each mother and her child. 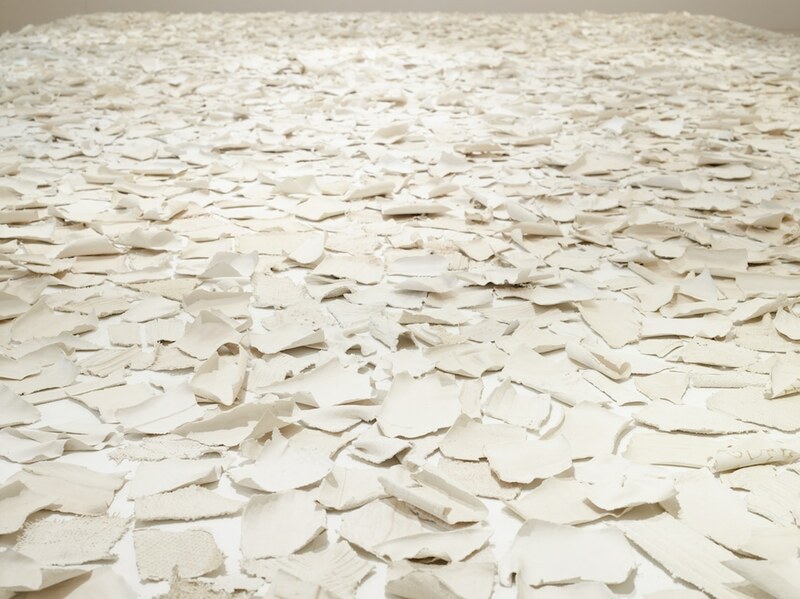 The mothers’ intense feelings of separation and loss find a visual analogy in Carey’s vast ceramic outpouring. 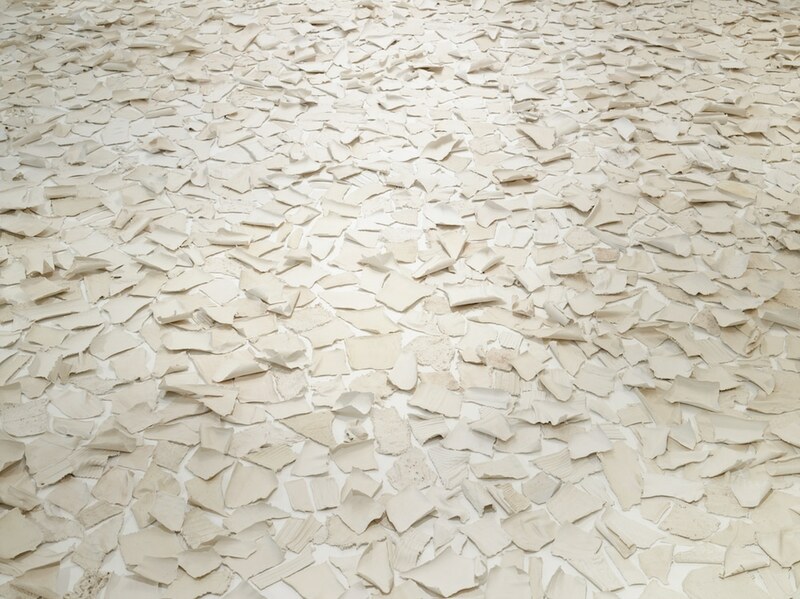 However, despite its overwhelming scale, Sea asks the viewer to recognise the detail of each unique cast and to see each as a small memorial and an act of remembrance. 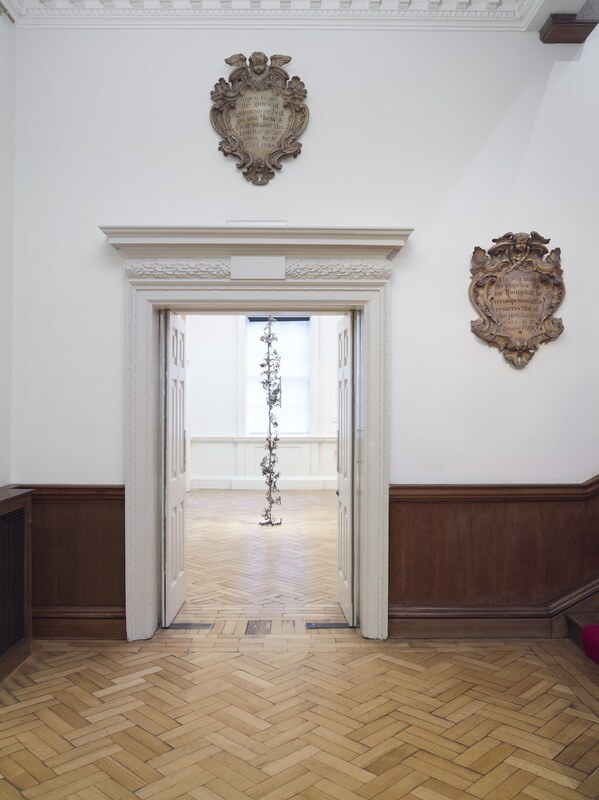 Among the Museum’s historic Collection on the first floor, two monumental works explore ideas of memory and time. 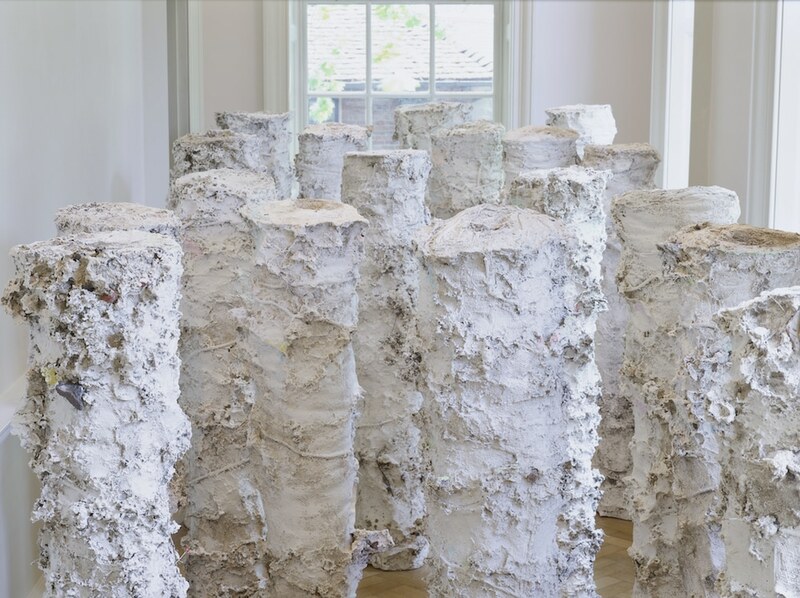 Found is formed of 18 life-size, totemic sculptures that crowd the Anteroom, each cast from the void left by rolls of fabric buried in soil. 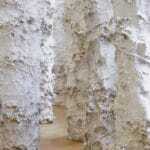 Found creates an environment that feels both natural and sacred, and suggestive of a ruin or archaeological find. 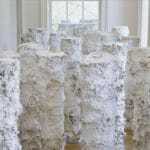 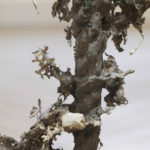 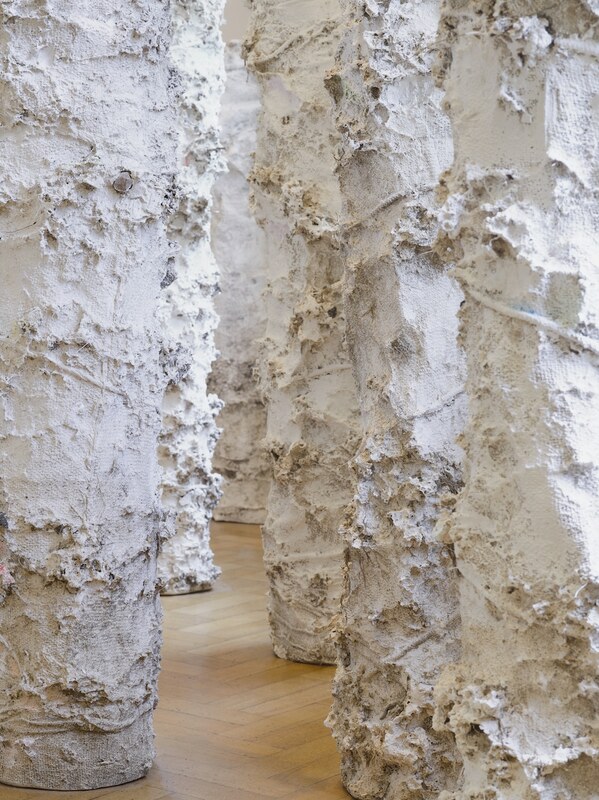 The poured plaster bears traces of the land in which the sculptures were cast – centuries of soil, stones and plant roots. 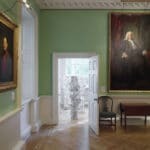 This earth-bound process resonates with the elemental nature of the Foundling Hospital narrative of love, loss, hope and survival. 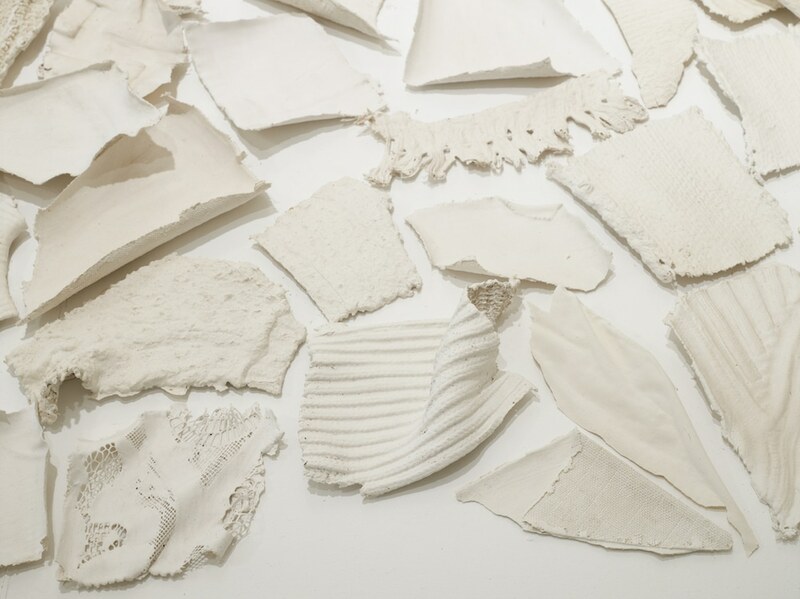 In casting bolts of fabric, Carey references the significant role that cloth played in the Hospital’s story – as emblems of hope for the mothers, methods of identfication for the institution, and routes of employment for the children – while final marks made by the artist using tailors chalk, are suggestive of storytelling. 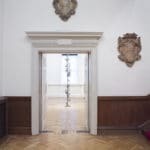 Cord, displayed in the Foyer, is a delicate and slender bronze sculpture that stands floor to ceiling. 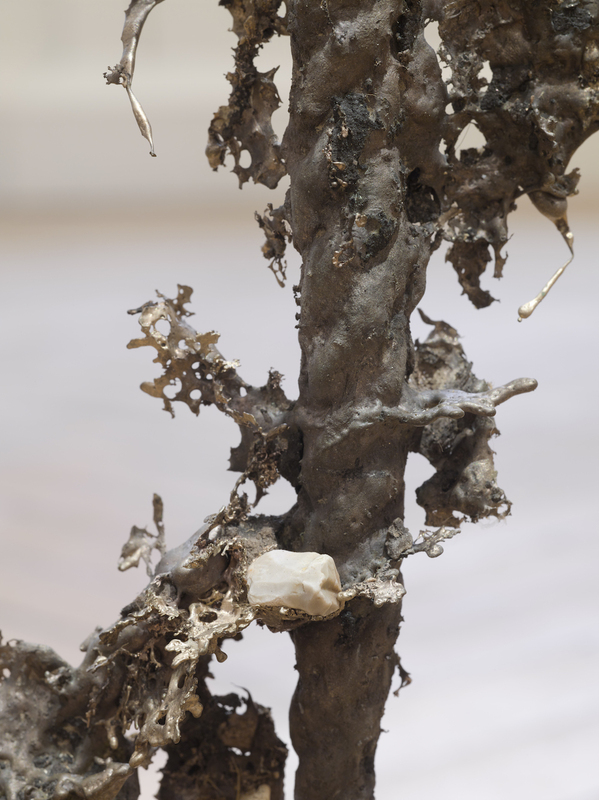 Cast in bronze from cord buried in the earth, the sculpture appears both fragile and brittle, its contorted appearance belying its material strength. 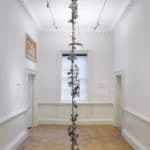 Referencing not only the bond between mother and child, but also the relationship between institution and foundling, Cord seeks to make visible the fragility of relationships so fundamental to human existence, and questions whether such bonds can ever be broken. 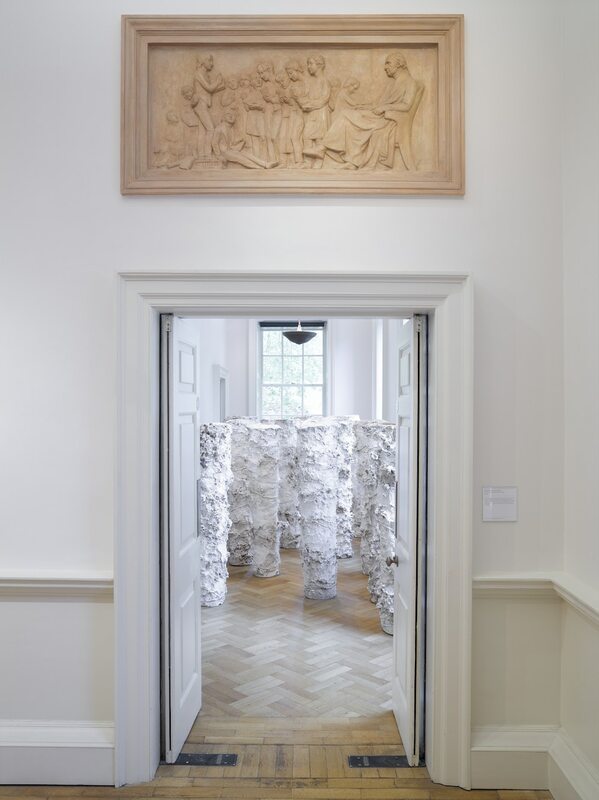 These commissions form part of the Museum’s 2018 programme of exhibitions, displays and events to mark the centenary of female suffrage, by celebrating women’s contribution to British society, culture and philanthropy from the 1720s to the present day.